The International Heat Transfer Conference (IHTC), nicknamed the Heat Transfer Olympic, is the worlds premier conference for scientists and engineers in the heat and mass transfer research community, who convene every four year to exchange the latest information. Previous conferences have greatly enhanced mutual exchanges of knowledge and experience, and nurtured new and/or interdisciplinary research areas. Future conferences should realize an increasingly important mission: to foster international cooperation and facilitate the exchange of ideas among colleagues in order to solve urgent problems and improve peoples lives in the years ahead. To pursue these aims, we invite forward-looking scientists, engineers, and researchers from all over the world to attend the Fifteenth International Heat Transfer Conference (IHTC-15) in Kyoto, Japan, August 10 to 15, 2014. In addition to exploring traditional research areas, IHTC-15 asks an important question so that we may better serve society: What is the role of thermal science in meeting societal challenges? Clearly, we face major issues such as ensuring sustainable development, healthy ageing, sufficient food for all, and economic growth, and we need to develop scientific and technological solutions. To do this, we should shape our current and future roles more concretely, and start to formulate an interdisciplinary framework for collaboration among colleagues active across a wider range of physical, life, and information sciences. IHTC-15 will provide participants with unique opportunities for exchanging new knowledge, and facilitate intensive discussions throughout the conference period. We hope that IHTC-15 becomes a model for future IHTCs, and magnifies the scope of contributions made by the international community of thermal science professionals for the benefit and welfare of people everywhere. Plenary/Fourier Lectures and Panel Information The slides and handouts of the plenary/Fourier lecture and panel sessions are available for download. Plenary lecture "Science of Scientific Advice"
Fourier lecture "Thermal Science and Engineering - From Macro to Nano in 200 Years"
Plenary panel "The Role of Thermal Science in Meeting Societal Challenges"
Panel "The Role of Thermal Science for Nuclear Disaster Resilience"
CHECK the NEW website which presents the main topics discussed as well as important information that Panelists and Attendees provided during the session! Please find the letter from the Executive Committee chair to Participants and Colleagues. Clicking the comments in the pdf file takes you to each page. Summary of IHTC-15 Please find the slides of the Closing which summarizes IHTC-15 at – "Summary of IHTC-15"
Letter to Participants Thank you for attending IHTC-15. We appreciate if you can take a moment to read the letter to the participants. 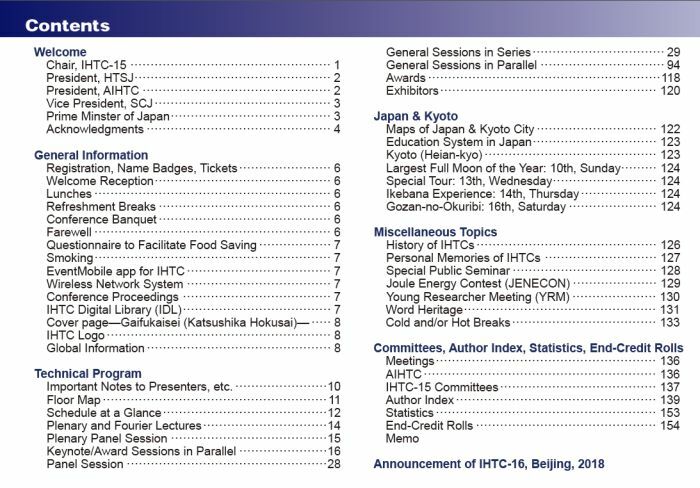 – "Letter to Participants"
Articles and Reports (only in Japanese as of Dec. 25, 2014) The reports of IHTC-15 have been published in the Journal of the Heat Transfer Society of Japan. The record of personal experiences written by Prof. Shohji Tsushima has been published in the Journal of the Japan Society of Energy Resource. Conference Photographs A selection of photographs taken at IHTC-15 has now been uploaded. Please enjoy the photographs from the IHTC-15. The photos are from the reception, plenary lectures, keynote lectures, panel sessions, banquet, opening & closing, JENECON, public seminar, and the young researchers meeting. – Photos from JENECON and public seminar. – Photos from young researchers meeting (YRM-Kyoto). – Photos from Pre-banquet event "Ikebana Experience". Mobile app EventMobile for IHTC-15 We are pleased to announce that the EventMobile for IHTC-15 is now available for download. EventMobile is a mobile app for conferences that helps participants browse the conference schedule, check information about speakers, view floor maps, check exhibits, create customized schedules, received alerts from the conference office, and also connect with other participants. Enter <http://www.tripbuildermedia.com/apps/ihtc-15> in your mobile device's web browser. This link will automatically detect your phone type and access the appropriate page where you can download the app. Or search the Apple App store and Google play market using the keyword "IHTC-15". Further information, please visit the following site <http://www.ihtc-15.org/eventmobile.shtml>. Only IHTC-15 participants can log-in to EventMobile. Your ID and password will be sent to you by email from TripBuilder Media . We invite forward-looking scientists, engineers, and researchers from all over the world to attend the Fifteenth International Heat Transfer Conference (IHTC-15). IHTC-15 will provide every participant with a unique opportunity to exchange state-of-the-art knowledge and enjoy extensive discussions throughout the conference period. We hope that IHTC-15 will magnify the scope of contributions made by the international community of thermal science and engineering professionals for the benefit and welfare of societies around the world. Nuclear, solar, geothermal and renewable energies. More than 1,300 abstracts have been submitted to the IHTC-15. Approximately 800 accepted papers passing the rigorous manuscript reviewing will have the highest quality that is equivalent to well-established international journals. All contributed papers will be presented in ORAL SESSIONS which are categorized by the international science committee. Attending these sessions and joining the participants, you will be able to go in-depth, on the topics that best interests you. Overview Familiar images of Japan come to life in Kyoto. The city limits contain opportunities to experience leading modern technology and architecture, neon lights and deafening gaming parlours, graceful geisha and serene Buddha, a formidable castle and secluded temples, and even lush green rice paddies. Seventeen UNESCO World Cultural Heritage Sites are situated in a cityscape dominated by 2000 temples and shrines. The city offers you endless opportunities to gain meaningful hands-on experience of rich Kyoto culture through Tea Ceremony, sake brewing, kimono wearing, swordsmanship, and more. Japan is renowned for its safety and the compactness of Kyoto makes for wonderful strolling. There is a great deal to see and experience in this city during free time in the business schedule and for accompanying persons who want to venture off site. 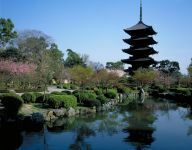 (See "Travel information" > "About Kyoto"). 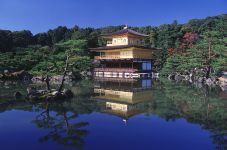 Kyoto is located near the centre of Japan and the legendary transport network makes it easily accessible not only from all international gateways, but also to other magnificent cities of Japan. From Kyoto you can reach Nara, Osaka and Kobe the neighboring and historical cities of Kansai region by only 1 hour using the local train transportation. From Kyoto station the comfortable and state of the art Shinkansen bullet train will carry you through the country to either the north or south end of Japan. The train arrives every 10min with the miracle minimum delay, average 36sec for 0.12million trains per year (See "Travel information"). 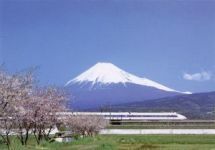 JR railways provides the Japan Rail Pass which offers an incredibly economical way to travel throughout Japan by rail. (See JR Pass). Gozan-no-okuribi (Daimonji okuribi) Gozan-no-okuribi, meaning "the fires sending back our ancestors lit on the five mountains", is one of the most traditional and impressive events in Kyoto. 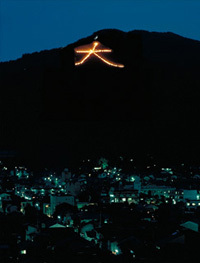 Giant Chinese letters and symbols are enlightened silently in the complete darkness of the night of midsummer. The fires are lit in sequence from east to west on the five mountains surrounding Kyoto starting from the Daimonnji mountain with red fires shaping the Chinese character of Dai meaning of "Large" followed by the other four "Myo-Hou", "Funagata", "Hidari-Daimonji" and "Torii". This event origins from ancient religious activity to fire the torches to send back the ancestors temporarily staying for a few days with the people in the present world during the O-bon festival in August to the world beyond. With this event taking place in middle of August, people appreciate the summer they enjoyed and feels the breeze of the coming Autumn they have expected. The event has been close to the heart of Kyoto people, and hundreds of thousands tourists gather to Kyoto in the evening of August 16 to share this feeling. 8/5/2016 Report on the Plenary Panel uploaded. 8/6/2015 Link to IHTC Digital Library (IDL) establised at top page. 25/12/2014 Link to article of Journal of Heat Transfer (in Japanese) established. 23/12/2014 Article from Journal of Energy and Resources (in Japanese) uploaded. 22/9/2014 Full version Photo Album uploaded. 17/9/2014 Closing slides summarizing the IHTC-15 is uplaoded. 16/9/2014 Link to the webpage related to JENECON uploaded. 15/9/2014 Photograph of public seminar and contest JENECON uploaded. 14/9/2014 "Memorial Slides between IHTC-14 and 15" uploaded. 28/8/2014 "Historical Data toward IHTC-16 and IHTC-17" uploaded. 28/8/2014 Top page layout updated. 26/8/2014 Photograph of Pre-banquet event "Ikebana Experience" uploaded. 26/8/2014 Photograph of Young Researchers Meeting YRM-Kyoto uploaded. 26/8/2014 Booklet of Award Banquet uploaded. 25/8/2014 Fourier lecture slides uploaded. 22/8/2014 Plenary lecture and panel session slides and handouts uploaded. 22/8/2014 Photograph during the conference uploaded. 18/8/2014 Letter to participants uploaded. 11/8/2014 Photograph just after the opening uploaded. 5/8/2014 Conference proceeding site opened ("Proceedings"). 3/8/2014 A site with usful information opened ("Kyoto Travel Tips"). 31/7/2014 Introduction of IHTC Logo opened ("IHTC Logo"). 26/7/2014 Reception and Banquet site updated ("Reception and Banquet"). 25/7/2014 Conference Program booklet released. 21/7/2014 Pre-banquet event for accompanying person site opened ("Tours"). 14/7/2014 EventMobile app released "EventMobile"). 12/7/2014 Exhibitors list in "Exhibition"). 10/7/2014 EventMobile now available for download. 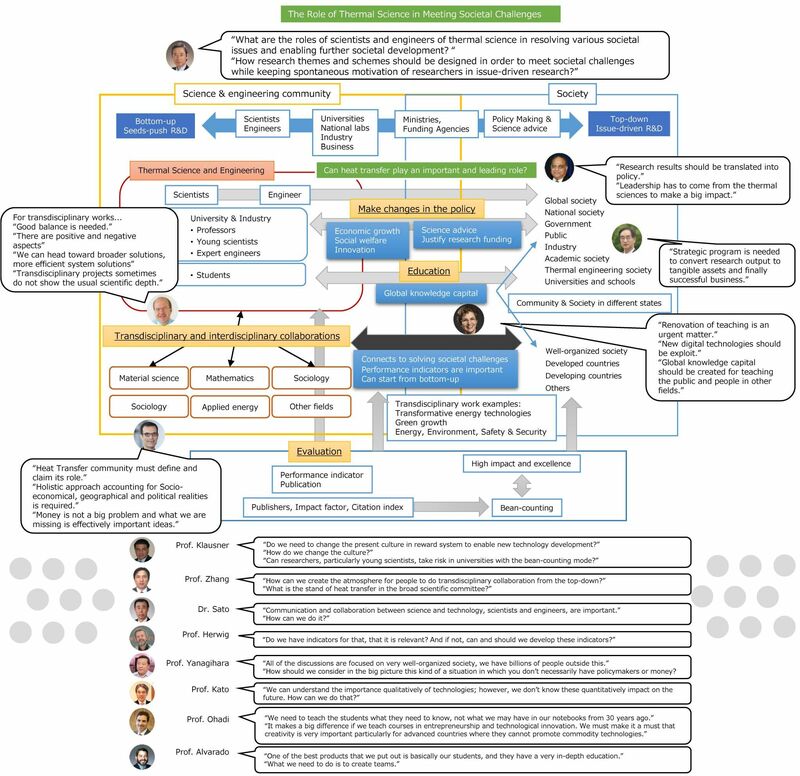 8/7/2014 Keynote lectures program updated in ("Keynote Lectures"). 8/7/2014 At a glance program updated in ("Program"). 4/7/2014 At a glance program updated in ("Program"). 25/6/2014 Final program uploaded in ("Program"). 20/6/2014 Special tour site opened ("Tours"). 20/6/2014 Presentation information is updated ("Presentation"). 16/6/2014 Full program released ("Program"). 15/6/2014 Session program with paper numbers is updated ("Program"). 12/6/2014 Session program with paper numbers is uploaded in "Program". 7/5/2014 Session program is uploaded in "Program". 7/4/2014 "Panel Session" information updated. 31/3/2014 Registration site for "Young Researchers Meeting (YRM)" opened. 25/3/2014 "Venue" and "Access" information updated. 13/3/2014 Information of "Who should attend" uplaoded. 1/3/2014 Hotel booking is now available. Please visit the "Accommodations" site. 1/3/2014 Registration site openned. Please visit the "Registration" site. 24/2/2014 "Accommodations" and "Visa" site updated. 28/12/2013 "Young Researchers Meeting (YRM)" site opened. 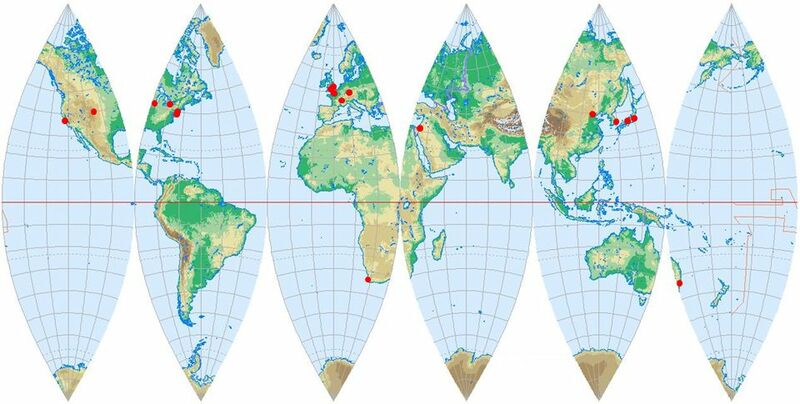 24/12/2013 "Keynote Lectures" information updated. 10/12/2013 "Panel Session" information updated. 20/11/2013 "Online Submission System" for full manuscript opened. 24/10/2013 Full length manuscrip submission information added. 1/9/2013 Abstract submission deadline extended to Sep. 15th. 26/8/2013 "Program", "Banquet", "Visa", "Access" sites opened. 26/8/2013 "paper submission" site updated. 19/8/2013 "paper submission" site updated. 10/6/2013 "Digital Library" and "Lectures & Panel Sessions" sites opened. 5/6/2013 Registration fee and important dates announced. 22/5/2013 Abstract submission site opened.